Galaxy A5: How to install the SIM card or USIM card? 1 Insert the SIM or USIM card provided by the mobile telephone service provider. Only Nano-SIM cards work with the Galaxy A5 . Some LTE services may not be available depending on the service provider. Insert the ejection pin into the hole on the SIM card tray to loosen the tray. 3 On case of Dual SIM models, place the SIM or USIM card on the SIM card tray with the gold colored contacts facing downwards. 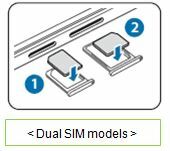 Place the primary SIM or USIM card on the SIM card tray 1 ( 1 ) and the secondary SIM or USIM card on the SIM card tray 2 ( 2 ). Please check the direction of SIM card which placed on the SIM card tray 2. The SIM card tray 2 also serves as the memory card tray. However, you cannot place both the SIM or USIM card and the memory card at the same time. 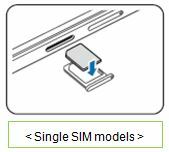 And, if you have single SIM models, Place the SIM or USIM card on the SIM card tray with the gold colored contacts facing downwards. Please use caution not to lose or let others use the SIM or USIM card. Samsung is not responsible for any damages or inconveniences caused by lost or stolen cards. Ensure that the SIM card tray is closed tightly to prevent water and dust entering the device. Open or loose the try may allow water and dust to enter the device and cause damage. Galaxy A5: How are the parts layed out on the device?